The PrestaShop 1.6 E-Commerce platform is an actual php based application and as such it uses quite a complex file structure. In order for you to have a restore point of your website in case of emergency you will need to know how to backup and restore the files used by your Store. Our PrestaShop Hosting package includes free backups of your entire account, however just in case you would like to perform your own backup you can read the next few lines of this tutorial. In order to backup all the files used by your Store you will need to connect to the FTP service for your account. If you are not quite sure what is FTP service and how you can connect to the same please check our quite detailed FTP tutorials. Once you perform a successful connection to the FTP service of your account with us you will need to navigate to the folder where your PrestaShop 1.6 is installed. The tricky part here is that if your Store is accessible on subfolder (yourdomain.com/subfolder) or a subdomain (subdomain.yourdomain.com) you will need to locate the correct folder on your account before you can start the backing up procedure. If however, your Store is located on your primary domain (yourdomain.com) you can simply navigate inside the public_html folder. Now that you are in the correct folder and you are able to see all those .php files you will need to select them all by clicking on any file, using key combination CTRL+A, right-clicking with your mouse and finally selecting the Download option. Keep in mind that the files will be downloaded in the folder you have selected in the left side of your FTP client or the so called Local Site. Once you click on the Download option all the files will then begin downloading and as soon as the download process is finished you will have a full scale backup of your website. In order for you to restore the files of your store you will need to have a local backup ready to be uploaded on your account with us. The local backup is an actual early version of your website which you have downloaded previously following Step 1 of this tutorial. Now that you have your local backup prepared you will need to once again connect to the FTP service for your account and then to navigate to the correct folder where your PrestaShop 1.6 based store is installed. 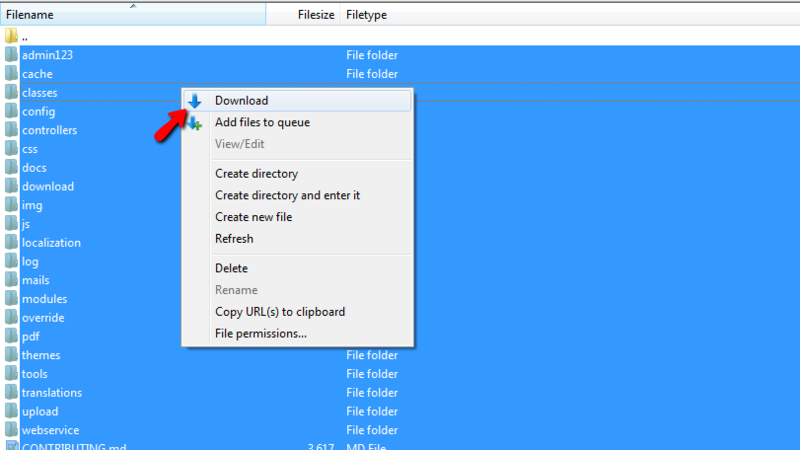 Then you will need to select all the files from the left side of your FTP client by pressing ky combination CTRL + A, to right-click with your mouse on any of the selected files and to finally click on the Upload option. Then most probably you will be asked if the files on your account with us should be overwritten. Since you would like to restore a backup then most probably you will need to overwrite the existing files. 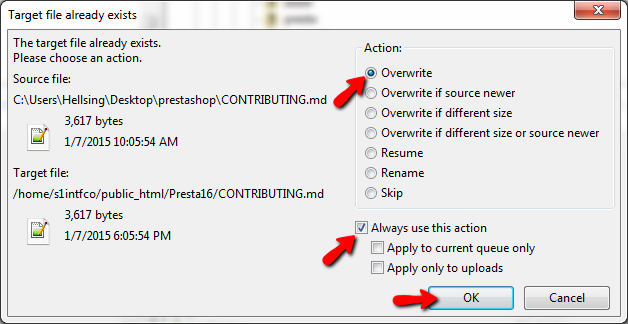 In order to do so you will need to click on Overwrite and then to check the ckeckbox called Always use this action. 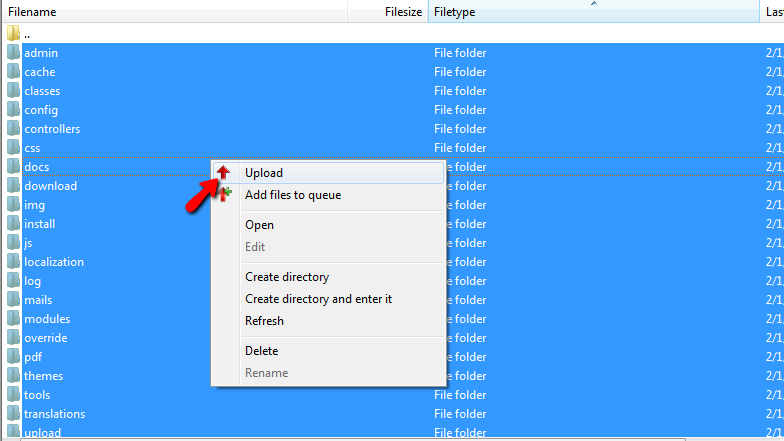 Next you will need to simply click on the Ok button so the upload and the file replacement can begin. When the uploading process is finished the restoration of the files used by your Store will be finalized! Congratulations! You now know how to backup and restore the files of your PrestaShop 1.6 based Store!